Can dogs eat scallops? – Like so many human foods we discuss on the site, your dog can eat scallops, as long as it is in moderation. According to the ASPCA, non-fried cooked scallops are safe for dogs to eat. In fact, the Association states that it is okay to feed your dog all kinds of cooked shellfish. Scallops, shrimp, lobster or crab – as long as they are fed in moderation they present very little risk. So what exactly does in moderation mean. What if your dog is a Great Dane, surely they can eat more scallops than the poodle next door. The advice we can give on this is stick to very small amounts. Never close to anything like a meal. A bite or two is all you should give your dog of human foods such as this. The major problem actually comes from simple introduction of a strange new food. Dogs cannot always adjust to dietary change. Any approach must be slow. If you introduce too many new foods to your dog, diarrhea and stomach upset are often the end result. While the odd cooked scallop may be a fine treat for your dog, a fried one isn’t. The ASPCA rules out giving fried scallops to your pet. In fact fried foods altogether, are not recommended. Fried foods contain high levels of fat that can contribute to pancreatitis in canines. At the very least, fried scallops may also give your dog stomach pains. If it is hard for you to resist feeding your dog while you sit munching away at your scallops, have something less offensive to his digestive system on standby. Dogs are not fussy eaters; he will enjoy any attention he gets from you in the way of receiving some food while you eat. (Although, we would say that this is bad practice in itself). Flavorings can also be a problem if you decide that your dog can eat scallops. If you cook the dish with excess ingredients such as butter, salt or spice – these are things that might not agree with your dog. Butter is a dairy product, and the majority of canines digest lactose very poorly. The result is often diarrhea. 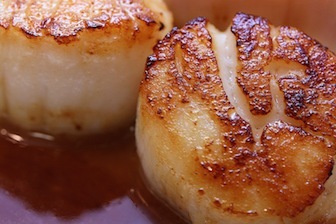 If the scallop is covered in too much salt, this will also affect your dog. Frequent urination and inordinate thirst are one of the outcomes of increased salt in a dog’s diet. Raw scallops are not recommended for your dog, unless you have introduced a raw dog food diet with other types of fish. Again, any approach to this must be made slowly and with the correct knowledge. Should you wish to experiment with a raw food diet for your pooch, I would recommend heading over to the Raw Paws website. This is an exceptional resource with lots of products covering this controversial subject. For more information on raw feeding your dog, head here. For information from the ASPCA on nutrients your dog needs, head here. 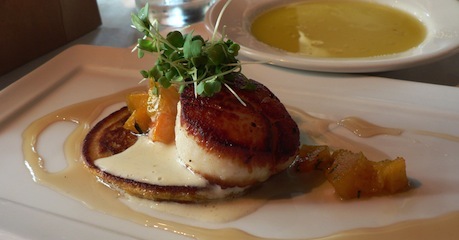 For the nutritional value of scallops, head here. Can dogs eat scallops? If you have any comments on your own experiences with feeding your dog scallops, please leave them below.